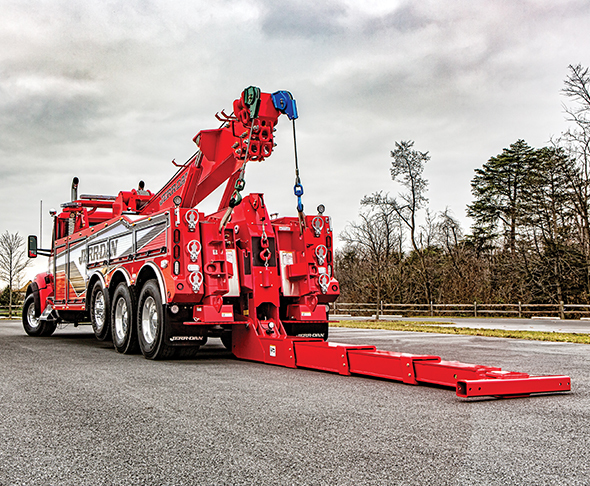 Jerr-Dan’s 35-, 50- and 60-ton independent wreckers provide you with multiple options that can be configured for your application. Available with the JFB body for multiple chassis configurations. High-strength steel fabricated booms. Multiple underlift options available with capacities up to 56,500 lbs., reaches up to 177” and maximum negative tilt of 16 degrees. Dual main-boom winch capacities up to 50,000 lbs. and drag winches up to 35,000 lbs. Three section main wrecker boom available on 50-ton. Call 800-926-9666 or visit www.jerrdan.com.